Eric Kipp, founder and owner, integrated his passion for exploring the nooks and crannies of San Francisco with his yoga practice. As a tour guide, he led groups in Hawaii, Alaska, and California for many years. Hiking Yoga became his platform to get people in their bodies, explore their community and enjoy the beauty of nature and friends. Eric fell in love with any sport as the son of a college basketball player and world series champion baseball player. Lifting weights, training, running and all the fitness that supported organized sports filled his days. After college he took to hiking, spending his first summer in northern California in 1992. Eric toggled between yoga and martial arts in his 30’s and then committed to yoga as his primary practice and teaching. The immense benefits he gained from yoga and the exploratory elements of hiking just seemed too perfect to combine. When he first started the company it was just a one-man show, and had no idea it would expand across the country. He is very proud and thrilled to offer Hiking Yoga to multiple communities nationally! Critical to Hiking Yoga’s rapid ascent has been leveraging social media and other low-cost, massive-return marketing techniques. Customers come to discover something new about their city, while others are visiting and want a unique way to explore the place and meet locals. Many of these people have come to Hiking Yoga through outlets such as Facebook, Twitter, TripAdviser, Yelp, and Groupon. Word of mouth spread through social media and soon new locations started popping up on the West Coast. People were drawn to bringing some fresh air into their yoga practice. The format attracted people newer to yoga because the stations combined postures they already knew and loved. 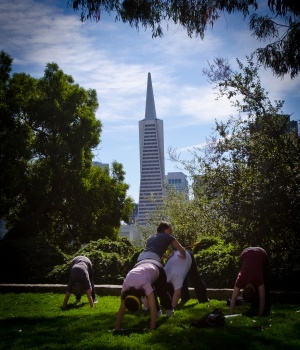 Hiking Yoga offers an invigorating experience for newbies and advanced yogis alike.